The World of Warcraft: Battle for Azeroth expansion is now live starting August 14. Start with the Battle for Lordaeron if you haven’t, and travel to Kul Tiras (Alliance) or Zandalar (Horde) to begin your journey in search of new Allies and Azerite. IRVINE, Calif.–(BUSINESS WIRE)–Aug. 13, 2018– The tensions between the Horde and the Alliance have reached the breaking point, and the entire world of Azeroth is now consumed in the fires of war. Battle for Azeroth™, the seventh expansion for Blizzard Entertainment’s internationally acclaimed massively multiplayer online role-playing game World of Warcraft®, is now live! Today’s launch signals the start ofa new era of all-out warfare between the Alliance and the Horde, as players around the globe set out on a vital mission to ensure that Azeroth’s future belongs to their faction. Defenders of the Alliance are called to the kingdom of Kul Tiras, ancestral home of Jaina Proudmoore, to enlist the aid of their legendary navy, while champions of the Horde must seek allies in the distant empire of Zandalar, home of the ancient Zandalari trolls. As part of the campaign ahead, heroes will clash for critical resources in myriad Island Expeditions; draw upon the strength of Azerite, lifeblood of the planet, to unlock new powers using the Heart of Azeroth artifact; prepare for a massive confrontation on the Warfront of Stromgarde; recruit new Allied Races to bolster their faction’s cause; and much more. World of Warcraft: Battle for Azeroth is available in physical and digital standard editions (SRP $49.99) as well as a Digital Deluxe Edition (SRP $69.99). The latter contains an arsenal of in-game bonuses for a variety of Blizzard games, including the Seabraid Stallion mountn (Alliance), Gilded Ravasaur mount (Horde), and Tottle the Baby Tortollan pet for World of Warcraft; an “Azeroth Is Burning” card back for Hearthstone®; a Primal Flamesaber mount in Heroes of the Storm®; Horde and Alliance sprays for StarCraft® II; and a collection of faction-themed cosmetic loot for Overwatch®. Battle for Azeroth is also available in a retail-exclusive Collector’s Edition (SRP $99.99). In addition to the in-game items from the Digital Deluxe Edition, the Collector’s Edition contains a cache of faction-themed loot, including a collectible Horde and Alliance Double-Sided Mark of Allegiance; a limited-edition hardback of the novellas ElegyandA Good War,featuring exclusive artwork; and a Battle for Azeroth digital soundtrack. 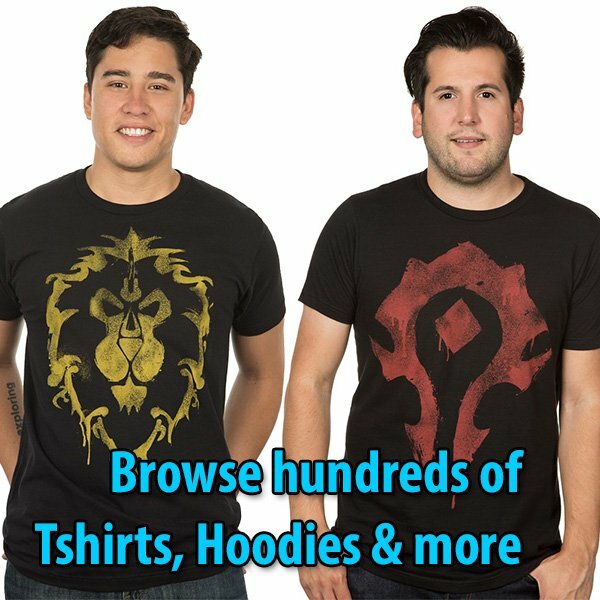 For additional details, visit https://worldofwarcraft.com/battle-for-azeroth. Each edition of Battle for Azeroth also includes a level-110 character boost so players can immediately head to the front lines and fight for their faction’s cause.† In addition, new players interested in joining the fray for the first time with this expansion can do so simply by purchasing Battle for Azeroth and subscribing to World of Warcraft, which unlocks full access to the original game and all previous expansions. Explore Two Fabled Kingdoms: As a champion of the Horde, travel to the empire of Zandalar to persuade the trolls to lend their naval might. As a defender of the Alliance, venture to the seafaring kingdom of Kul Tiras, home of Jaina Proudmoore, and rally its inhabitants to fight for your cause. Recruit Allied Races: Take a new form for your adventures as several new playable Allied Races, each with unique racial abilities. Earn the favor of the Dark Iron dwarves, Mag’har orcs, Highmountain tauren, Void elves, and others to create a new character of that race and add their strength to your faction. Plunder the Islands of the Great Sea: Set out on Island Expeditions and conquer an ever-changing array of enemies, environments, and objectives. Battle in groups of three as you race against cunning rival intruders—or enemy players—to collect each island’s resources and fuel the war effort. Prepare to Charge the Stromgarde Warfront: Get ready to fight on the battlefields of a large-scale, 20-player cooperative Warfront to claim a key strategic location. Capture resources to build your faction’s forces, lead the charge as your troops lay siege to objectives, and fight the enemy commander to claim victory in this new mode inspired by classic Warcraft real-time strategy–game battles. Infuse Your Armor with Titanic Might: Seek out Azerite, an invaluable new resource that has emerged in the Burning Legion’s wake. Imbue the Heart of Azeroth—a legendary neck piece entrusted to each hero by Magni Bronzebeard—with Azerite to customize your armor with new powers and traits. To learn more about World of Warcraft: Battle for Azeroth, visit the expansion’s official website at www.worldofwarcraft.com/battle-for-azeroth. †Players upgrading from World of Warcraft Starter Edition must wait for trial restrictions to be removed (up to 72 hours) before using character boost.